NEW! Will they SEE your products on display? Marketing on the Web: "Build it, and they will come!" How to work with Solarez Safe Resin. The Arts/Crafts Business versus "Traditional" Business. Thinking about setting up your own website ? Do Frogs Need Insurance? No, but craftsmen do! Time Management - A rocky tale. Trademarks: How to use your trademark correctly . : Are you interested in registering your trademark? Need a source for a search ? Build your Consignment Contract after considering these basics. Pricing Your Work : formulas and logic . What Happened to Our Shows? Legal Issues : Starting Your Own Business: sales tax registration; problems with zoning, checking accounts . Craft Show Equipment : A check list to help you pack - probably a few things you haven't even thought of. How do you know if you're making a profit? First you have to talk the talk, - then maybe you can walk the walk ! Merchant Credit : Is it Lots of Extra Work? Merchant Credit: Here's information to compare fees, and a good source . Dollars and cents! Sales Tax Problems: PYA! Why you really need a tax permit, and Contact Information for Sales Tax Departments in various states. Affordable Housing for Craftsmen and Artists - Arizona! For hundreds of new shows , covering Connecticut, Massachusetts, New Jersey, New York, Pennsylvania, Vermont, Georgia, Illinois and the rest of the Central and Easter states. We publish show reviews, and articles to help you with your business. Sell more. Find the right events to sell your arts and crafts, sell food, sell promotional items and more. VENDORS, Artists, Crafters, and Event promoters -Find where the shows are! 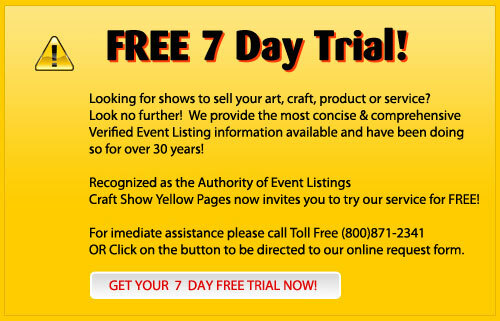 Instant access to our system, all verified events and event details to help you sell more! Legal Issues - Starting Your Own Business Sales tax registration; problems with zoning, setting up a business checking account - more. This is where you begin. Sales Tax Problems: PYA! with Contact Information for Sales Tax Departments. Merchant Credit : Is it Lots of Extra Work ?